Just 45 minutes by car from Cancun International Airport, between two of the best golf courses you will find Hacienda Escondida. This colorful and magnificent 3 tower development each with 12 condos, captures a colonial style custom-design in the gated residential community "El Cielo"where residents benefit from controlled access, lush green tropical vegetation with hiking and biking paths. Hacienda Escondida condominiums are designed to make families feel like home. Enjoy your day at the beach located within walking distance, or spend your day at the private cenote. This Penthouse has a unique colonial design featuring private terraces, two spacious bedrooms, two full bathrooms, air conditioners, closets, open concept kitchen, open dining room and living rooms with 1560.77 ft2 interior construction and 1019.44 ft2 rooftop. 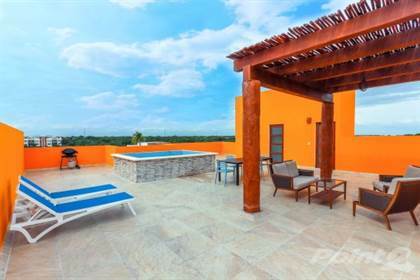 The private rooftop is the perfect place to BBQ, relax in the custom jacuzzi tub, or lay in the caribean sun. The development has green areas surrounded by tropical vegetation, a river-style pool that runs throughout the tower which fits perfectly with landscape, and a cenote where you can swim freely enjoying the sunny day with the family! Hi, I'd like to find out more information about Hacienda Style Penthouse with Ocean View & Private Pool on Roof ( 19992 ). Thanks so much!